One of the all-time great issues, unquestionably: the clarity and vividness of the design is remarkable. The Greek government approached the Paris Mint in 1860 to commission their country's first set of stamps, and they were eventually rewarded with the design we have here. The designer was Albert Désiré Barre, who was at that time Chief Engraver of the Mint, and the design itself is heavily inspired by the famous French Ceres of 1848 (Wikipedia)*, which was designed by Jacques-Jean, Barre's father and predecessor as Chief Engraver. Barre the younger was embroiled in some confusing dispute with Anatole Hulot, the Mint official responsible for the printing of postage stamps, and so Barre decided in the end to bypass Hulot and delegated the job of printing these stamps to Ernest Meyer, who ran a typesetting firm in Paris. The first production run was done in Paris and then the printing plates were transferred to Athens in November 1861. 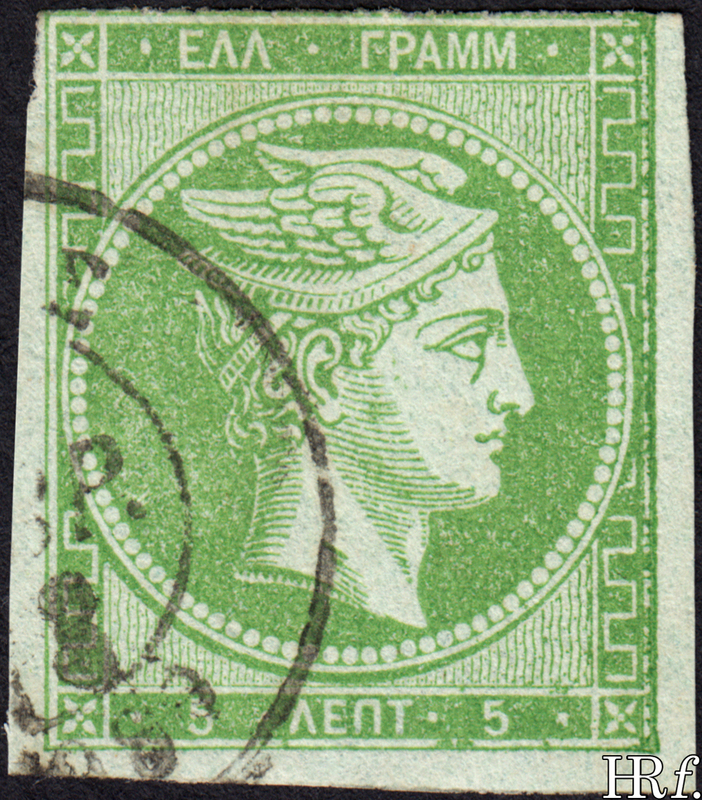 The issue lasted a remarkable 25 years before finally being retired in 1886 (replaced by the "Small Hermes Head," which is more Hellenistic in feeling but quite a fussy, unattractive design). 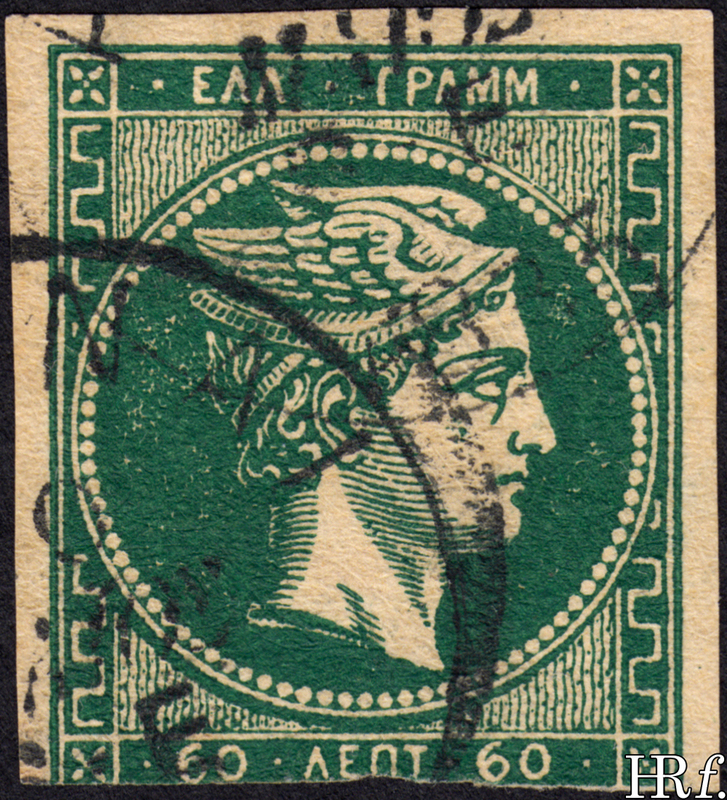 This issue has long drawn the attention of specialists: close inspection allows one to distinguish a Paris printing from an Athens printing, and the Athens printings are sub-divided into about ten different varieties. All this is a little too intellectual for me, although I know enough to say that none of the stamps on this page is a Paris production. The printing plates were probably not designed to last as long as they did, and production quality dipped as the years progressed (although it is, I think, a great credit to the design that it retains its strength even when printed indifferently). Interestingly attempts were never made to perforate the stamps (though a few private individuals had a go), even though perforation had become essentially ubiquitous by the 1870s. Shortages of newer issues in 1900 led to a few values being dug up and overprinted: I don't propose to deal with these here. If we put the specialised varieties aside, this is mostly an easy issue to deal with. The initial values were 1, 2, 5, 10, 20, 40 and 80 lepta. 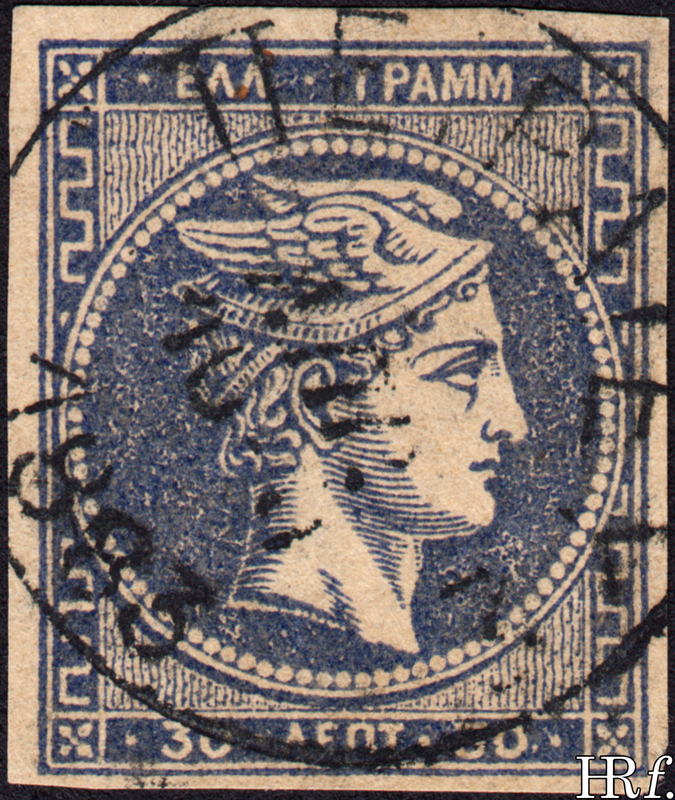 Greece joined the Universal Postal Union in 1875, and this caused a few changes in postal rates: the 30 and 60 lepta were first issued in 1876 as a consequence. In 1882 the rates changed again, causing the colours to shuffle around a bit: the 20 lepta went from blue to red, and the 30 lepta from brown to blue. ** The 10 lepta was (mostly) printed on blueish paper until 1882 when it changed to brownish paper. 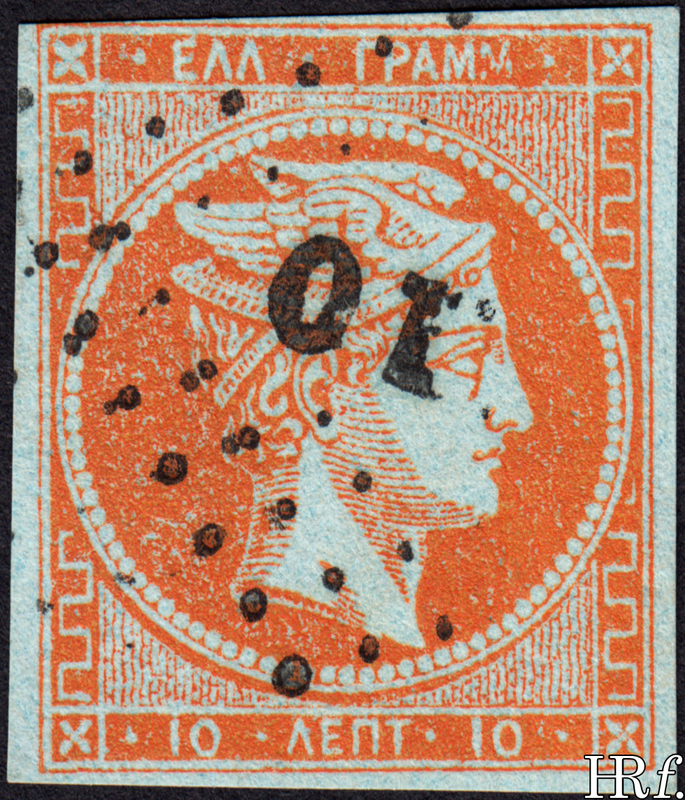 The 40 lepta is the most complicated value: to give a vague, unhelpful summary the earlier issues were purple on (usually) blueish paper, the middle issues purple or brown, and the later issues grey, light-brown or greenish. I certainly don't have all the colours up here: some are unfortunately rather expensive. Other than the absentee 40 lepta colours this is a complete "face different" set. *The Ceres was a design held in high regard at the time, and there were quite a few other countries which took inspiration from it for their own stamps, to varying degrees of success. **The Postal Union had, for a time, a very neat system where member countries were required to colour their stamps according to the service they provided: red was for stamps the value of mailing a letter domestically, blue for the value of an international letter, etc.